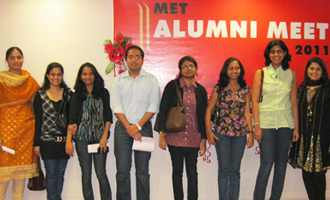 MET Institute of Pharmacy (Degree) organised Alumni Meet on January 08, 2011.The event began with an interactive session of our current batch pharmacy students with the alumni. Alumni Mr. Amod Athavale, Ms. Manasi Datar and Mr. Clive Mendonca gave an overview of Pharma -administration course - M.S. and Ph.D. course in U.S.